The F2 is a low-profile, wraparound style that provides excellent optical clarity and peripheral protection from scatter radiation. Snug-fitting and lightweight with integral venting for cool, long duration comfort. Durable Nylon Frame is ANSI Z87.1 approved. The F2 is fitted with the exclusive Schott SF6HT leaded glass lenses that provide up to 20% more light transmission than standard leaded glass lenses. All lenses are standard with 0.75mm Lead Equivalency, High-Lite Transmission Lenses with 20% More Visible Light, 1.80 High Index Lenses. Our optional Anti-Fog/Anti-Reflective Coating is a new generation multi-part coating that improves vision performance by reducing lens reflections and fogging. The anti-fog component of the coating actually absorbs moisture, thereby reducing lens fogging. 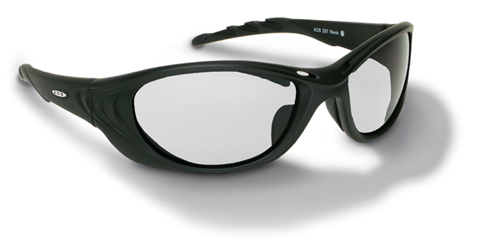 The optional Leaded Side Shields provide additional lateral radiation protection in the area beyond the main leaded lens. They are installed on the inside of the temple and do not affect vision or comfort. The vinyl covered lead foil provides .50mm lead equivalency lateral protection.